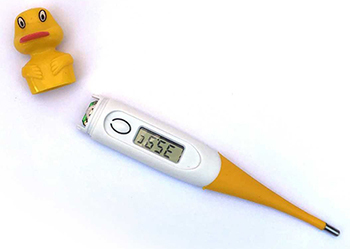 Consumers and health professionals are advised that St John Ambulance Australia, in consultation with the TGA, is recalling all electronic thermometers supplied in the Tiny Tots First Aid Kits. 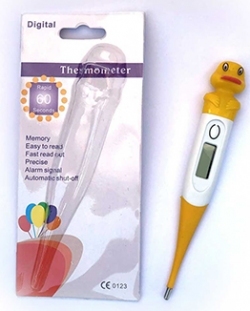 While these thermometers are not intended for use by children, the design may encourage children to play with them. If so, it has been identified that a part of the device shaped like a yellow duck can be removed by a young child, providing them access to the button battery. 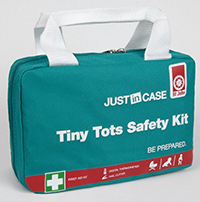 If a child ingested a button battery, they could suffer internal chemical burn injuries that, without appropriate medical treatment, could lead to permanent injury or even death. The battery could also pose a choking hazard or potentially perforate the oesophagus. Please be aware of this issue and advise parents of child patients accordingly if they seek advice.